(CNS): The premier said he hoped the people of Cayman would realize that he is working hard for them in order to turn the economy around, as he wrapped up the budget debate in the Legislative Assembly on Monday afternoon. 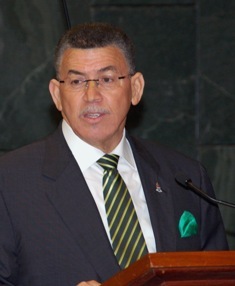 McKeeva Bush spoke for more than four hours as he answered the questions and criticisms of the opposition bench. Defending the budget figures and the decision not to cut civil service numbers, Bush said that his economic policies had worked and that was how government had achieved a surplus for this financial year. Having turned government finances around, he said, he was not going to risk further compromising the local economy by cutting local jobs. Bush explained that this was the argument he had presented to the Foreign and Commonwealth Office when questions were being raised in London about the level of personnel costs and the government’s failure to stick to the three year plan. He said he had protected jobs for Caymanians and the local economy from more austerity. He said there was flexibility in the budget and spending had been increased in key areas such as policing, education and health in an effort to deal with the pressing social issues. With the CUC cut Bush said he was delivering on a previous promise made when he was forced to remove the fuel rebate during the first budget. Now government had the money, he said, he could give it back but he said he did not need to notify CUC until he had found the money and the power company would be informed shortly. Although the budget did not receive written approval directly from the UK, the Governor’s Office confirmed yesterday that OT Minister Henry Bellingham and the premier had discussed the budget before it was presented last Friday. “The Cayman Islands Government developed their budget in line with those discussions, and with the intention of meeting the targets set in their published medium term plan,” the office confirmed on Monday via email. The spokesperson noted that the Cayman government was at liberty to decide how money is spent or cuts made. “The UK is just keen that finances in the Cayman Islands return to a sustainable track,” the office stated. Bush said that the finances were in much better shape and the numbers in this budget were correct, and despite the criticisms from the opposite benches, the central government surplus was $12 million before the losses from statutory authorities were added and that was the normal way to present the budget. The premier suggested the opposition had failed to find anything wrong with the budget and had displayed ignorance of economics during their questions and criticisms. He also complained about the constant disagreement in every corner of society and accused the former opposition leader, Kurt Tibbetts, of throwing cold water on everything. Bush also took aim at the current leader of the opposition and accused him of having a dramatic road to Damascus conversion over the rollover policy. Bush accused Alden McLaughlin of criticising without the facts, of not understanding economics and of spreading rumours to destroy him but of having no viable alternatives. During the week of budget debate, he said, after all of the attacks he had not heard one single idea from the opposition benches to raise revenue or create jobs. Throughout the four hour presentation the premier spoke at length about constantly being investigated and reviewed and said the opposition were creating doubts to make him look bad. He said that while it was him they were trying to make look bad and scandalizing today, he warned it would be them, or their children, in the future. Bush said, however, they could go to the governor, the police commissioner or the auditor general as “his heart was pure and his hands clean.” The premier said he had done nothing wrong but that things were not getting done because of constant accusations and in the end it was the Caymanian people that would suffer. “It is my job to move this economy,” Bush added. As he commended his budget to the Legislative Assembly, he said he had done much to improve the budget position of government, and while there was still some way to go, he was proud of what had been done so far. In its second reading the budget bill passed, with nine government votes over three abstentions by the opposition and independent member. Three of the opposition members were also absent from the chamber when the division was called. The Legislative Assembly was adjourned for Finance Committee, which is chaired by the premier and will now scrutinize budget appropriations for all government entities. Check CNS this week for more on the premier’s closing budget speech including comments on the Cohen loan and immigration, as well as detailed reviews of public spending plans for 2011/12. Mr. Premier show them how much of a man you are. I know you will and can turn this economy around. Let them see the many investors that you have lined up to invest here. I know that they will eat their words. You just go full speed ahead with everyone of your projects that will benefit these islands. This must be hillarious to FCO. We propose a surplus budget but dump reliable reporting that would prove it one way or another. The desk clerk and his friend must be rolling around everytime Mac calls..I bet he puts him on speaker phone. Let's be realistic ppl. We constantly complain about what a failure Sir Bush has been to the country and the people…I agree but actually NONE of the politicians deserve any merit. It's all talk and BS we buy in to come election time and vote them in!! I agree the current pool of politicians isn't great and I actually openly supported UDP in last election (sorry all). However I did not believe it was possible for one man (with support of party "yes" men) to so blatantly abuse his position and totally circumvent due process and established procedures of accountability and transparency. We have taken huge steps backwards in the democratic evolution of this country. And my personal opinion is the UK is giving us enough rope to hang ourselves. Hense why I grade them all zeros! This is what happens in a real Democracy. check it out at http://www.reuters.com/article/2011/06/21/us-economy-california-budget-pay- Imagine if Cayman was a real democracy. You would never have to pay your leadership again. "Mac defends budget"? Hahahahahahahahaha! And did I say Hahahahahahahahahaha! Did you get it? "Mac defends budget"! That is funny! Is he just talking to the Civil service here? Does he even realizethat many Caymanians do not work in Governments welfare job system? Maybe he thinks they all can't read still. Explains why there is no big push for education. Our people has to take a stand now and say we are not going to support CUC's fuel charges and pay only what we us at the end of the month. six residential homes were disconnected in Bodden Town today, Four un employed and four elderly. It is a down right shame what Caribbean Utilities is doing to the country, along with the UDP government, but fellow citizens listen to this. Dont for one moment think that a new government will do anything to change this. No they wont. They are all Talk, talk. The people of Cayman need to have the guts they used to have and march. Sit down in front of that door at CUC until something is done. Do we have a leader ?,…………………….I thought so. Why don't you lead? Since it's your idea and all…………………thought so. You do only pay for what you use. Whose fuel bill do you think you're paying? Mine?! CUC only charges you for the fuel used to produce the number of kWh's that YOU consumed. Simple. Was he the only one working on the budget? How is it that he hopes we understand that "he" was working hard? I'm going to go ahead and thank the 'behind the scenes' folk for their hard work and say McKeeva, we want you to continue to work hard… hope we're not asking too much. You are appointed leader of our country afterall. Your position calls for late nights and early mornings and when necessary, 24 hour work days. If you can't handle it, I'm afraid we'll have to let you go. Law & accounting firms have similiar standards but the most 'prestigous' office in our country shouldn't? hmmmm….. If he was hired instead of voted in he would have been fired a while ago for incompetency, double dipping, missuse of funds, inability to follow rules and regulations, inability to follow instructions, Too many paid vacation days, to name a few. Sorry but to ask me to understand that he is working hard? You would have to be very stupid to belive that. Good thing for him the people of Cayman have such low stndards. The really sad part about all this is that not a single one of the UDP puppets have the balls to stand up and say, "enough is enough, screw the great salary, I am going to stand up for my country and for what is right and save my own face, and show the Caymanian people that I am a man to my word. ANY one of you sleepers can do this right now and make an unimaginable difference for the betterment of your country. Hell you might even stand a chance of getting re-elected in two years. One thing I guarantee you, Mac has no intentions whatsoever of sharing any of his vast retirement lode with any of you. If Mr. Bush would give the people more respect and listen , be open minded, I do beleive Mr. Bush would get more support in what he does. I am not a party member of either but I do hope and Pray that these two parties can find some common ground and work together and stop the fighten. This is a very small Island and its people needs help now. If things dont get better soon we will all loose and loose big. I am sure most people care of the direction the country is going be local or resident. Please wake up and let us work together. Mr. Bush not sure if you understand your job role but that's the reason why you was elected by the people of this country to work hard. Thats why you get the bog salary you get to work hard self praise dont get no one in life ok. Does anyone else wonder why the "Maintenance of the Electoral Register" needs $311,041 to operate in 2011/2012? Seems like some fat could be trimmed there…. While i agree with the Premier that "he is working hard"….it is the "manner" in which he behaves in regards to "due dilligence" and "process" that is so concerning. Some of his proposals will indeed likely "turn the economy" but there still needs to be clear Transparancy, Accountability and Good Governance" at all levels of the process! These are NOT meant to be just Soundbites! But should be the guiding Principles of all Democratic Governments! Do so and he will surely find more cooperation and respect from all….locally and overseas! more hot air and gobbledygook……… mac, your days are numbered! Seriously? FFS, if your middle eastern compatriates can oust their dictators, why do none of you have the cahones to even speak up in public, rather than from the anonymity of this forum? Put up, or shut up. You are becoming as pathetic as your 'leaders'. Maybe the Americans will help out the oppressed Caymanian people…well maybe once we get the oil refinery. "he did not need to notify CUC until he had found the money"
You removed the requirement of reliable reporting so good luck finding the money Gilligan.